A mobility aid such as a walker or rollator is considered a first step towards reducing the risk of trips and falls. Living Well HME carries a wide range of mobility aids in various models to help you remain as active and physical as safely possible, both inside and out. Outdoor walkers are safe for indoors as well, while indoor walkers won’t roll as smoothly outdoors and are recommended for minimal use outside of an area with even, smooth terrain. 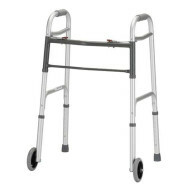 The terms rollator and walker are often used interchangeably however a rollator is actually a type of walker that includes a seat, wheels, and hand brakes. 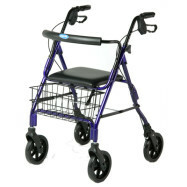 A basic walker will not have a seat or handbrakes and is typically only used indoors. Most rollators & walkers include a basket to help the user focus on walking and keep them stable instead of trying to carry items.